As preparations for the annual gathering of indigenous youth were underway last month, security issues intensified in a number of areas in Upper Pulangi, Bukidnon, where half of the expected participants live, and fear and insecurity in the communities grew. Around 100 indigenous youth from the Pantaron Mountain Range area in Mindanao were scheduled to join the Tapok, as the gathering is called. The theme was “Culture of Peace,” a phrase that evokes the tradition and value for peace of the indigenous youth’s ancestors. In January, the communities were disturbed by the presence of some armed rebels. In February, government armed forces became active in the area, and so the indigenous communities themselves decided that the Tapok was best postponed. The activity was eventually held last 9 to 11 March, a couple of weeks after the armed groups have mostly left. This is the reality of how peace must be sought, coming from the lack of it. Peace may be understood through theoretical and political discussions and by analyzing its impact on economic investment and local development. In communities suffering from decades of armed presence, people are constantly at the receiving end of the pressure, and they become bound by fear and the inability to act. Jason Menaling explains the importance of the community’s role in sustaining the forests and water of the Kiasu and its contribution to the hydropower dam in Maramag. Within the indigenous cultures of Mindanao, there are many traditional practices of establishing levels of peace. 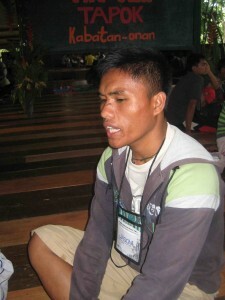 In the Upper Pulangi area, there is a culture of peace that is part of these youth’s history. The Tapok is an opportunity for indigenous youth to learn about the broader context of the peace concern that affects them. The event is also a venue for obtaining a deeper understanding of who they are as indigenous youth of the Pantadon (the mountain range where they live with their communities), and what their relationship is with the land and the environment that sustain them. Many of the youth are beginning to understand how their tribe’s names are linked to rivers and how this relationship plays an important role in their culture and traditions. The youth are becoming aware of the cultural history of their people and how their forebears worked hard to sustain peace in the area. They are also learning that they have much to contribute and that not all effort and solutions must come from outside. Rather, peace can come from the integrity of the individual and the importance of forming strong community processes for engagement. Seventy-eight out of the expected 106 youth participants eventually joined this year’s Tapok, accompanied by nine tribal leaders. The tribal leaders were grateful for the occasion and they had their own amul-amul or gathering on the side, with time for betel nut chewing. The Tapok participants came from the barangays and sitios of Impasug-ong, Calabugao, Cabanglasan, and Malaybalay City. Some of the barangay officials and parents were initially hesitant about having their youth join the event – this highlighted the need for continuous communications. 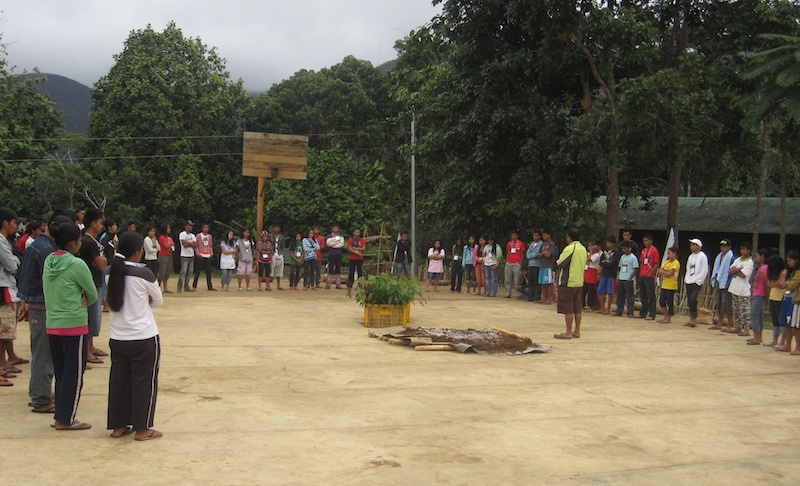 The gathering was held at Sitio Bendum in Barangay Busdi, Malaybalay, Bukidnon. Energy and optimism filled the two-day event. Despite their differences, the 50 young men and 28 young women engaged with one another, finding similarities and eventually, fostering new friendships. Games and group dynamics easily cultivated trust and camaraderie among the participants. Finding examples and stories that inspire and give hope was not easy for the youth participants, but there was joy and appreciation in learning more about the history of their tribes and what their ancestors stood for. What was most impressive was seeing the participants work in small groups, exploring ideas and relationships while discussing community concerns in a way they never experienced before. There were interesting sharings where participants spoke of their relationship with the environment. It was easy to see who learned things in school and who learned directly from the land. Discussions ranged from global environmental concerns to what trees are important for sustaining the local forests. Many participants were high school students, but some were not in school. The Tapok was a reminder that their culture and elders are also great sources of knowledge that are taught not in mainstream schools. Traditional farming and cooking practices are not inferior to those taught in school. While formal education provides additional learning, it cannot replace the cultural knowledge they need to live as Indigenous Peoples and sustain the environment they live in.